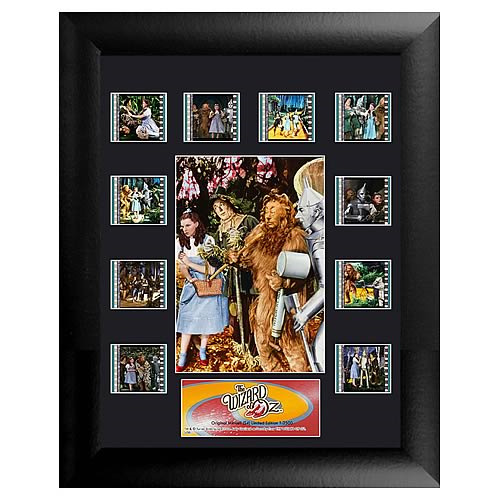 This amazing film cell features a print and an actual strip of film from the classic movie, Wizard of Oz . Measures 19-inches tall x 20-inches wide, limited to 2,500 pieces! Perfect for displaying in your home or at the office, all the elements are framed in black wood and includes a certificate of authenticity. Limited to just 2,500 pieces! Dorothy lives on a farm in Kansas until a cyclone arrives, and picks her, her house, and her dog up and deposits them in the land of Oz. Things in Oz are strange and beautiful, but Dorothy just wants to get back home. She's helped by the Good Witch of the North, but she's also in trouble with the Wicked Witch of the West, who seeks revenge for the death of the Wicked Witch of the East, for which she blames Dorothy. NOTE: The actual strips of film vary from piece to piece as they are hand picked from reels of film. Ages 15 and up.